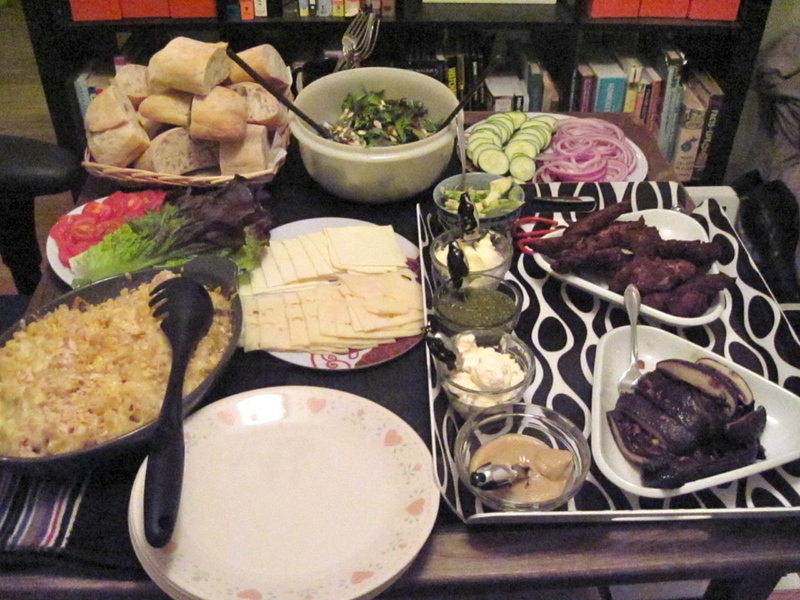 As the fifth Sandwich Party drew to a close on Monday night, AC & JE invited some friends over for a Big Sandwich Buffet, and we were lucky enough to be part of it. The Sandwich Party is underway! 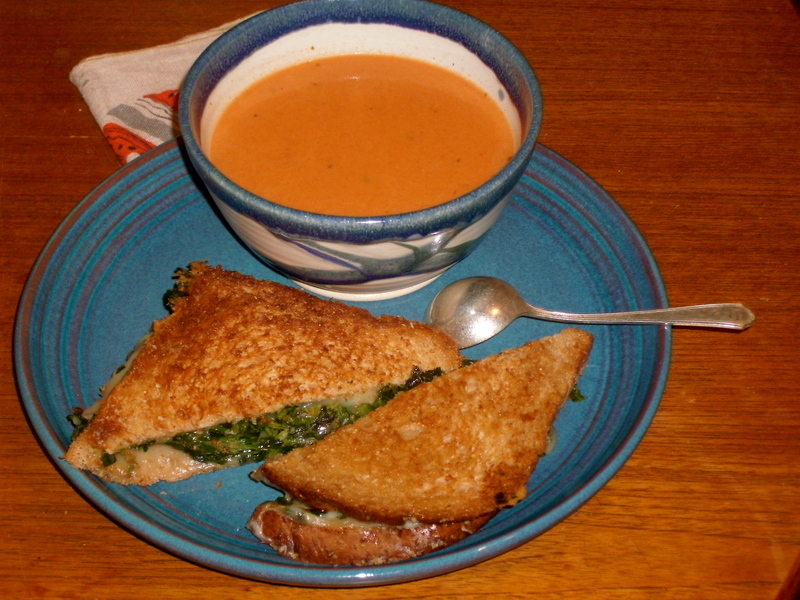 Friday night, The Fella and I kicked off the weekend with grilled cheddar cheese sandwiches stuffed with garlicky spinach, served with cream of tomato soup. The sandwich looks a mite sloppy, but I assure you it was just sloppy enough: the gooey cheese held the glistening, gorgeous spinach inside the crispy bread, and the whole thing made a perfect foil for the mild, creamy soup. I made some (cucumber and honey goat cheese) sandwiches a couple of weeks ago in anticipation of this, but I might do more this weekend. In the comments here, T.R. tells us about a sandwich with old friends! a family favorite: The Beltch. My mother, the polite lady that she is, chooses to put the vowel after the L, making it a Bletch (as if that’s a polite sound!). As you might have guessed, it’s a variation on the famous BLT (bacon, lettuce, and tomato), but adding cheese (CH). For proper BELTCH construction, a fried egg should be added to achieve full letter representation, but circumstances did not allow for an egg in this production. Carlarey has the breakfast of champions! So here it is, nothing fancy. Just a plain old working class turkey, salami, pastrami sandwich with shredded habanero cheese and jalapenos. It was what my kid wanted for breakfast yesterday morning, and it sounded so good I made one for myself. *Elsa’s note: NOT CHEATING! Bought sandwiches welcome! 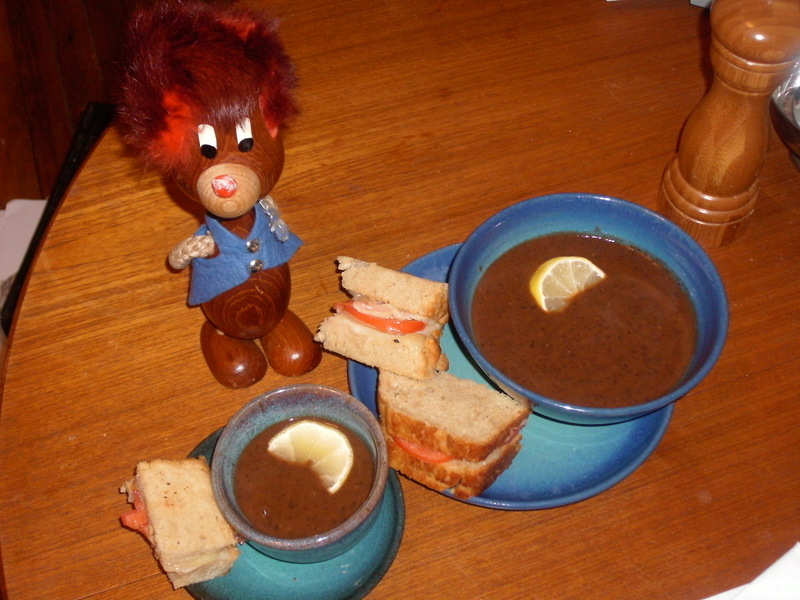 a hot sandwich of cheddar and tomato on beer bread, served with a brimming bowl of simple black bean soup. I discovered one day that if I took some of the sourdough bread that we had, slathered it with butter and garlic powder, and fried it, it made a delicious garlic bread, which is the perfect place to put a bunch of warmed spaghetti sauce. It’s a lot like a sloppy Joe, actually, though I like the flavors of spaghetti sauce better. My mom thought this was a disgusting idea, until she finally gave it a try, and became an instant convert. She always said that sane people are willing to change their mind when they are given the proper evidence, which this sandwich clearly is. Sounds tempting, doesn’t it? Join the fifth Sandwich Party — you still have time! Around these parts, we had a few hours without power and a looooooong stretch with no wifi, so I’m giving myself (and you!) a little extra leeway to get those last posts and links in. I can’t wait to see what sandwich you make! With Sandwich Party #5 coming up this weekend, The Fella and I were brainstorming a list of sandwich-centric scenes in movies and TV. I’ve been thinking about the diner scene from Five Easy Pieces. You know the one I mean: the scene in which Bobby Dupea (Jack Nicholson) wrangles with a waitress over a side order of wheat toast. The scene is famous — or infamous — for good reasons, and complex ones at that. At its simplest level, the diner scene editorializes on the changing times: the iconoclast tries to indulge his modest tastes, only to be blocked by the traditionalist, an unyielding stickler mired in arbitrary rules. This scene helped to establish Jack Nicholson as a counter-culture hero, and why not? He’s just a good-looking rebel who plays by his own rules. But there’s another level to this exchange, and I’d argue that it’s far more important than the inter-generational culture clash. Ultimately, the diner scene is about the confusion that comes with freedom, about the difficulty of discerning one’s own genuine desires. Watch the scene carefully. Bobby seems to know exactly what he wants, and he seems to know how to get it, even from their ornery waitress. He keeps his voice calm and civil, he’s well in control of his temper, and he’s negotiated her to a point of decision: she’s about to choose whether to take his precisely phrased order or to deny it. She’s peeved as she asks, “You want me to hold the chicken, huh?” But she hasn’t refused. Not yet. She’s noted down his many other requests: no potatoes, no mayo, no butter, no lettuce. She might, just might, jot down “no chicken” and curtly walk away to place the order. She’s balanced at the moment of decision. Of course the waitress kicks them out. Of course Bobby explodes in a fit of anger. Because that is what he wanted all the time. He wanted a fight, and he carefully constructed one. No substitutions. Because this is the center of Bobby’s character: he cannot be satisfied with what he has, and he will not be satisfied with anything he could receive. He doesn’t want what he has, he doesn’t want what you might offer freely, and he doesn’t want what he pursues.